The Assaults is one of the most intense, premier cycling experiences in the Southeast, and draws a full field of nearly 850 cyclists from across the world each year. The scenic mountainous course is as challenging as it is breathtaking but an experience to which cyclists return year-after-year to best previous personal records. We hope you will join us for The Assaults 44th anniversary on May 20, 2019, presented by Prisma Health. In 2015, due to the success of The Assaults and the opportunity to enhance charitable giving, The Freewheelers Club of Spartanburg, S.C. created a 501(c)(3) sister organization, The Freewheelers Cycling Association. The Freewheelers Cycling Association (FCA) uses a portion of the proceeds generated by The Assaults to support other non-profit organizations, including Finish-Strong cycling team, Partners for Active Living, the Challenge to Conquer Cancer, the Humane Society, the Mid-Atlantic Chapter of Multiple Sclerosis, Mt. Mitchell State Park, the Blue Ridge Parkway, the Palmetto Cycling Coalition and others. To learn more about The Freewheelers Cycling Association visit their website at freewheelersassociation.org. If you would like to learn more about the history of The Assaults and its founder John Bryan please visit http://www.polkcounty.org/mitch/assault.html. 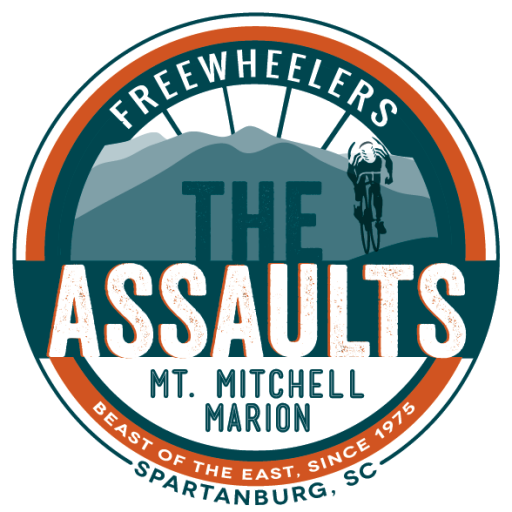 If you join the Freewheelers of Spartanburg Cycling Club during their 2018-2019 membership driver, you will receive a $10-discount code to use for The Assault on Mt. Mitchell and Marion registration. The ride was challenging and fun. The volunteers were so nice and helpful, especially at mile 60. This was my first one, and I will definitely be back next year. Loved it, best ride I have done! This is one of the highlights of my cycling season. A tremendous challenge.